The Honourable Commissioner of Basic and Secondary Education, Hon. 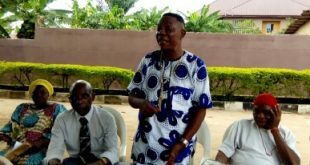 Chinedu Ebie had on the flag-off of the Advocacy for the Teaching of Indigenous Languages in Selected Pilot Schools in Delta State, said that it a wrong thing to do, teaching students who will end up not comprehending what is taught. This he said is a result of using alien languages like English and French to teach our Nigerian children who struggle to make meaning out of these languages before understanding the message. 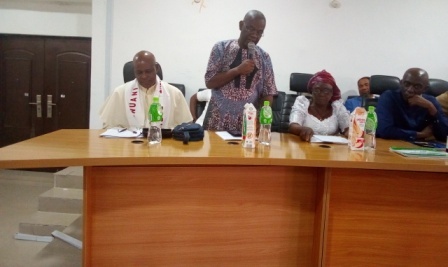 The advocacy programme which was held at Olorogun Felix Ibru Conference Hall, Asaba on Tuesday 9, April 2019 had the presence of the representatives of Ika, Isoko, Izon, Urhobo, Ukwani, Enuani and Itsekiri. Also speaking at the event, Mrs. Christie Akako commended Hon. Ebie for the promotion of the teaching and learning of indigenous languages. Her words, “I commend the Honourable Commissioner for Education for his giant strides towards the promotion of the teaching and learning of indigenous languages.” She went on to say, “the population of our country was recently estimated at 198 million inhabitants. Although Nigeria has three major tribes-Hausa in the North, Ibo in the East and Yoruba in the West, the country has over 250 ethnic groups and by implication about 250 languages as well. Leaders of thought have made efforts to see that indigenous Nigerian languages are taught in our schools. One educational psychologist once said that a child understands better what is taught in mother tongue than the school language. This is because at birth the mind of a child is totally empty and whatever value he is taught, whether formally or informally will register automatically in his mind, such a thing becomes indelible,” she said. It was an interesting event which ended with charge to revamp the lost interest of our indigenous languages and those who honoured the occasion returned enlightened, some publicly avowing to be communicating with their children in their local language henceforth.